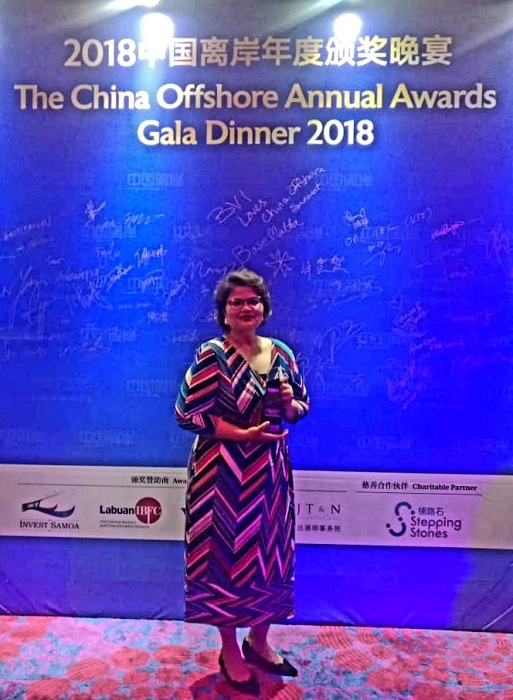 Kuala Lumpur, 16 November 2018 – Labuan International Business and Financial Centre (Labuan IBFC) won the Captive Insurance Jurisdiction of the Year award at the inaugural China Offshore Awards 2018 held yesterday in Shanghai, China. The Awards recognise and reward jurisdictions, service providers, organisations and individuals who have provided continued support towards developing international financial centres with a strong presence and contribution to the Chinese market. The nominees for the awards were selected by a panel of industry experts from a diverse range of disciplines, while winners for each category were decided by an independent panel, based on input from more than 70,000 registered users of China Offshore’s multiple media channels. The other nominees in the Captive Insurance Jurisdiction category were Bermuda Business Development Agency and Cayman Finance. CEO of Labuan IBFC Inc, Farah Jaafar-Crossby said, “We are extremely proud to receive this award and it is indeed a great achievement for us. This award is recognition of our unwavering and dedicated efforts in generating awareness with regard to the benefits of self-insurance structures, especially captive insurance in Asia. “It is a great milestone for Labuan IBFC and in fact, the first Labuan captive entity set up in 1998, originated from Hong Kong, which was run by professionals from the Chinese subcontinent and Malaysia. The CEO added that the jurisdiction’s commitment to the Chinese market is evident when Labuan Financial Services Authority (Labuan FSA) recently appointed Bank of China as a renminbi settlement bank for the centre, reinforcing the jurisdiction’s effort to facilitate the operation of Chinese companies by creating an efficient, seamless and cost-effective real-time settlement of renminbi-denominated transactions in Labuan IBFC. Chinese entities interested to use Labuan IBFC also have the option of registering their company name and Articles of Association in Chinese, providing a clear a sign of the level of openness towards Chinese-based businesses looking to expand into Asia, especially along the Belt and Road Initiative. It is worth noting that this is the second award the jurisdiction has won in relation to captive insurance this year. In August, Labuan IBFC also won the Best Asian Domicile award at the inaugural Asian Captive Review Awards 2018 and has also been shortlisted for the non-EU jurisdiction category in the European & UK Captive Review Awards 2018. A strong 10-member market development delegation from the midshore jurisdiction’s promotional and marketing arm and its intermediaries is on a week-long visit in Shanghai, China, comprising of business development meetings aimed at expanding Labuan’s intermediary base in China, participating in the China Offshore Summit and jointly hosting a bespoke masterclass with a leading trust and corporate service provider, CP Trust Labuan. Operating with clear and comprehensive legal provisions, guidelines and practice notes, enforced by a single regulator, Labuan Financial Services Authority, Labuan IBFC provides solutions for corporates and high-net-worth individuals with international exposure.